WHAT'S UP THE PIKE: Chevy Chase study insists Purple Line can't get federal funding; Takoma Park movie premieres at New York film festival; Pedestrian hit at 29 and Briggs Chaney last weekend; Man jumps in front of Red Line train at Wheaton. 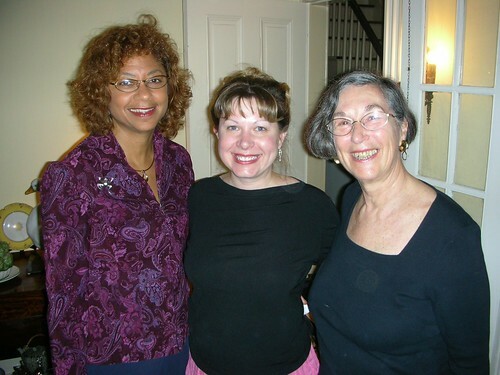 Catherine Leggett, wife of County Executive Ike Leggett, Olney Theatre manager Amy Marshall, and Delegate Karen Montgomery at the Lamb, Ham and Vegetarian picnic last Sunday. A diverse menu and a recent legislative victory were more than enough for Maryland's movers and shakers to brave the rain and attend Delegate Karen Montgomery's seventh annual Lamb, Ham and Vegetarian picnic held last Sunday in Brookeville. 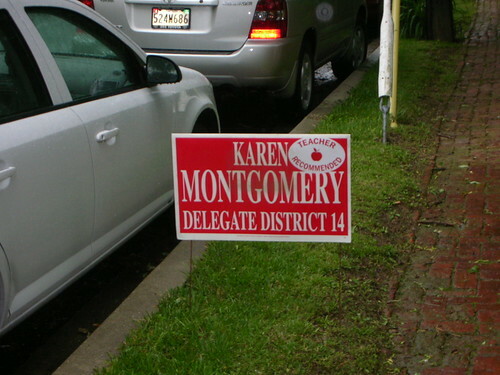 Despite uncooperative weather conditions, Montgomery (D-Dist. 14) entertained dozens of friends and colleagues at her home on Market Street, portions of which date to 1813. Between directing people in search of trash bags and jumping up to check the oven, she explained the secret to her cooking. "You put enough garlic and spices in," she says. Montgomery made the lamb and chili herself, while the roast beef, ham and rice were prepared by others. The biscuits, meanwhile, came from New Orleans-themed local eatery Popeyes. The delegate - whose sprawling district stretches from Damascus in the west to Burtonsville in the east - also received a certificate celebrating her recent success in ensuring that voter ballots can be easily recounted. Montgomery has been "working to ensure transparency, accuracy and accountability in our voting system," said Bob Ferraro of SAVE Our Votes, a nonprofit group demanding verifiable election results. 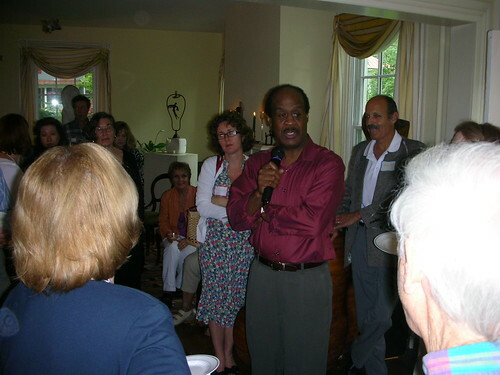 County Executive Ike Leggett speaks inside Delegate Karen Montgomery's living room. Maryland uses computerized machines from Diebold, the same company responsible for the ballot controversy in Ohio during the 2004 election. Demanding that they be able to provide recountable election results - whether on paper or electronically - was a "four-year struggle," says Montgomery, who was concerned about studies that proved they could easily distort voting records. "Two guys who had been indicted and jailed for computer fraud were working for Diebold," she says. "I frankly believe that using those Diebold machines that the election was stolen when Bush won. We need to have a record . . . that can be counted." Elected officials from across the state came out to support Montgomery, including Dels. Dan Morhaim (D-Dist. 11) and Charlie Barkley (D-Dist. 39) and Craig Zucker, representing Comptroller Peter Franchot (D). In addition, County Executive Ike Leggett (D) said a few words about Montgomery to an assembly in her living room. "I'm so happy to be here with the three delegates that represent me," says Leggett, who lives in Burtonsville. "I feel at home." Her next challenge in the State House will be the ongoing budget crisis, which she states is a symptom of the national economic slowdown. "It is not fair to tear into our people for what is a federal problem," she said, referring to the Bush administration's policies, earning her a round of applause from the crowd. 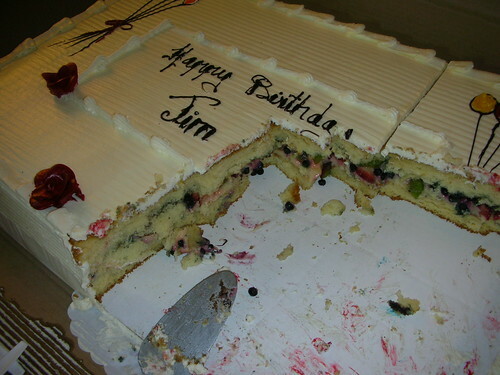 Alongside the lamb and chili was a surprise birthday cake for James Offord, Montgomery's perennial campaign chair and a Tamarack Triangle resident. Offord, who jokes he's turning "thirty-nine again," became friends with Montgomery after meeting her at the Olney Theatre several years ago and has since worked on all of her campaigns. As an African-American, Offord faced criticism for supporting a white candidate. "There's always subtle racial tension," says Offord. "People wanted to know why I was supporting this white woman and I said 'She's the best candidate. Race doesn't matter'." How, exactly, are the present economic circumstances of global fuel crisis and global credit meltdown the result of Bush Administration policies? I'm no fan of the present Administration -- the rank failure to Repel Invasion is the most glaring -- but global crisis is global crisis. To the degree that anything could have been done at a policy level, that should have been the job of Congress, which is not dominated by Republicans. Locally, it should have been the Maryland Assembly -- not the Governor, not the President of the US -- which should have understood the looming problems and have regulated affairs to ameliorate the inevitable and to prevent the preventable. They simply didn't do that; they were invested in the glaringly obvious Ponzi Scheme of "liar loans", repetitive refinancing and "frequent flipping". They saw this as a source of ever increasing tax revenues which could provide endless expansion of pet programs. Even as they mouthed the trendy phrase of the day, "if it looks too good to be true, it's probably not true", they saw nothing but endless perfect futures through their rose-tinted glasses. But all good times have their end and they should have foreseen this, planned for it, saved for a Rainy Day. Instead, they're blaming the victims and once again doing what they do best: shirking responsibility. It's not just the Democrats of Maryland and Montgomery, either. It's "a Maryland thing" regardless of party; blame the victim is the unofficial state sport. But let's have a reality check now and then or reality becomes something you no longer know how to see. The State and the County allowed themselves to get fat, drunk, and stupid on the glut of "easy money" that was being skimmed off of an unsupportable process that was doomed to collapse. That is no way to go through life, nor to balance a budget nor provide for the needs of the electorate. There are a lot of places the people could look to make cuts, but they've been running for so long down the path of supporting the unsupportable they have to play blame-the-victim in order to avoid becoming terminally embarassed (and rightly so) for having led themselves down the paths of polyannism. Don't blame Bush when it's your own darn fault. Blame Bush for what Bush has done, not for what was effectively out of his control and your own responsibility.